The HBO crime drama Boardwalk Empire is back on September 25. 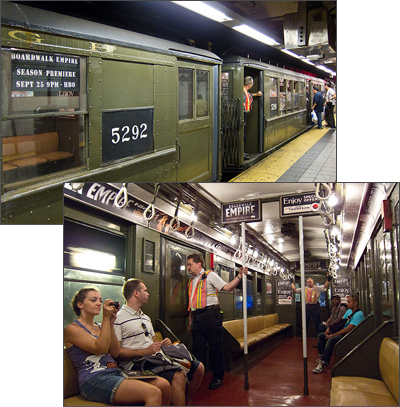 To help promote Season 2, HBO got together with New York’s Metropolitan Transportation Authority to run a Prohibition-era Interborough Rapid Transit train between 42nd and 96th streets in Manhattan during the weekends in September. The three-car IRT train features Boardwalk Empire-inspired ads, as well as vintage looking ads for saltwater taffy to ladies beachwear fashions. No word on whether they’ll be any Prohibition-era hooch available for sipping. I can’t imagine that the real-life ‘Nucky’ was a frequent patron of the Manhattan subways (he partied and had an apartment in NY). Enoch ‘Nucky’ Johnson most likely was driven from party-to-party in a style befitting an Atlantic City crime powerbroker; a 1920 Rolls Royce Silver Ghost, like this one used by Steve Buscemi’s character on the show. What TV shows are being discussed the most on Social Media? TV Guide knows, and has just launched their TV Social Power Rankings chart. 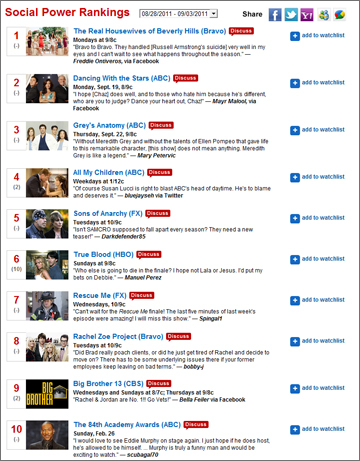 The chart is a continuously updated chart that ranks all TV shows based on how many people are checking in, or posting about them on Facebook, Twitter or discussing them on TVGuide.com itself. Neilson and Yahoo revealed that 86% of mobile phone users use the internet on their device while watching TV. Of those people, 33% were using mobile apps, 37% were browsing the internet and 40% were interacting with their friends on social networks like Twitter and Facebook. Social TV applications like Social Guide – which I wrote about previously – go a but further and show which shows are being ranked the highest during any time period throughout the day. SocialGuide also assembles a chart of most popular shows overall called the Social 100, currently topped by Jersey Shore, and Trendrr.TV’s Social Television Charts. Check out who’s topping the TVGuide.com Social Power Ranking chart today? We’re already several episodes into Season Four of AMC’s Breaking Bad and the intensity level is ramping up. AMC has always had great extra features supporting the show on their website. This year we have a weekly podcast, blogs by Hank and Marie and an interactive Gale crime scene evidence file. 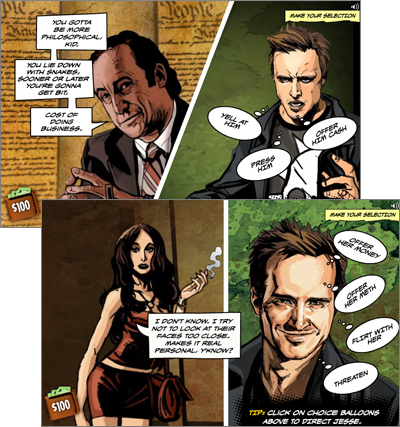 But the coolest addition this year is the The Cost of Doing Business – an interactive graphic novel game featuring Jesse Pinkman. In the game you play Jesse’s role trying to deal with prostitutes, sleazy lawyers (yes, Saul makes an appearance), a hitman and dangerous thugs to get as much of your stolen money back as you can. Your success depends on how your react to the other characters, threatening them, paying them off or providing them with meth. Or, in one scene you must beat the high score on a video game called Alien Slaughter to get crucial information from a pair of thugs in a bar. This isn’t the first time that Breaking Bad has created a graphic novel based on a character. In Season Three viewers were asked to help DEA Agent Hank Schrader try to outsmart a criminal in The Interrogation. 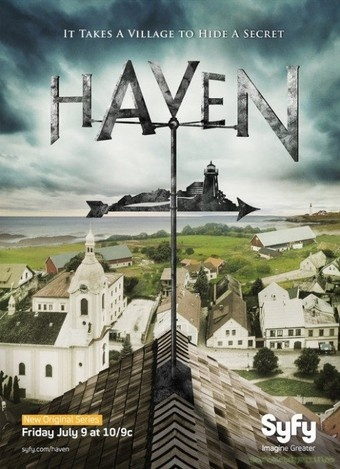 On the Syfy Channel’s popular show ‘Haven‘ the citizens of a small Maine town are affected by a wide range of supernatural afflictions dubbed ‘The Troubles’. Starting Friday, August 12 the show’s characters will face a new challenge as they be interact on Twitter with a mysterious stranger who seems to know a little too much about the secrets of the town. The seven-episode story-arc will feature events that play out both within the show and through the Twitter profiles of brothers Vince (@VinceHaven) and Dave Teagues (@DaveHaven), owners of the Haven Herald and the unknown someone tweeting as @ColdInHaven. Extending a TV show into another medium is not a new concept. The term Transmedia has begun to be used to describe a story being told across several different mediums. 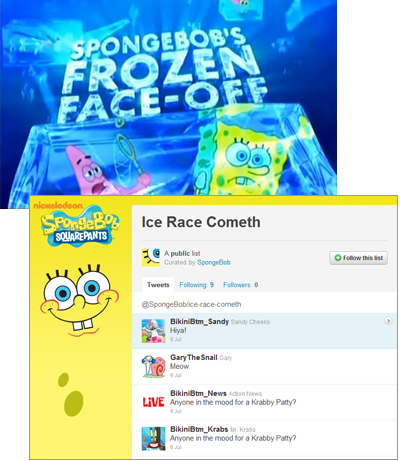 Just last month the producers of Spongebob Squarepants had several of the show’s characters on Twitter leading up to the Frozen Face-Off special episode. Over the last two weeks, Samsung and Intel sponsored the social experience Inside. Haven viewers can follow the story on Twitter with the hashtag #HavenNews or by following the individual Twitter accounts. Haven is broadcast here in Canada by Showcase. As a proud Nova Scotian I can’t end this post without pointing out that Haven is shot in and around the towns of Chester and Luneburg, on Nova Scotia’s south shore. Who tweets from a pineapple under the sea? Of course it’s Spongebob Squarepants, and this week he may be tweeting more than usual. This week the whole gang at Bikini Bottom will be going Twitter crazy as they tweet around a special Spongebob storyline. The fun begins on Tuesday, July 12 with a tweet from Bikini Bottom Action News that a “wealthy entrepreneur” has offered $1 million to whoever wins The Bikini Bottom Great Sleigh Race. The trash-talking will start on Twitter leading up to the Spongebob special ‘Frozen Face-Off‘ at 8pm Friday on Nickelodeon. Little does the gang know that while they prepare for the big race, Plankton is scheming to steal the Krabby Patty formula. This is not the first time that the folks at Nickelodeon has used social media as content around a Spongebob episode. Last January they used Facebook to launch ‘Trenchbillies‘. You can follow the fun this week by following the Ice Race Cometh Twitter list. You think there would be no room for more creepiness in Bon Temps where fairies, shapeshifters, werewolves and of course vampires all battle for attention. Now with Season Four of HBO’s True Blood ready to get started this weekend, the word around the backroads of Louisiana is that a coven of witches are joining in on the fun. Before all the onscreen craziness rolling again why not take a few minutes to Immortalize yourself and your friends in a clip from True Blood. The Facebook application grabs photos and information from your profile in a story that begins with Eric and Pam choosing a new dancer at Fangtasia. You’ll notice amongst the applicants the names and faces of a few of your friends. Watch my True Blood clip here. Season 4 of True Blood premieres June 26 at 9PM on HBO. Don’t run off and check your calendar after watching this commercial for Woolite, it’s not quite Halloween yet. The Woolite commercial above was directed by Rob Zombie. (insert dramatic pause followed by blood curdling scream here) Yes ‘that’ Rob Zombie, Dragula driver, rock musician and director of movies like House of a Thousand Corpses, The Devil’s Rejects and the remake of Halloween. 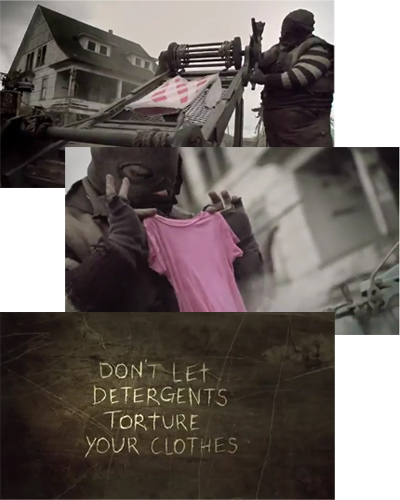 Zombie brings his dark, twisted vision to the laundry detergent brand courtesy of the New York office of Euro RSCG Worldwide. No mention in the ad of how well Woolite gets bloodstains out of your delicate laundry items, so make sure you check your labels. This is a couch-potatoes dream. If you have DirectTV CH 111 and at least 5 minutes of undivided attention you can earn a free Whopper simply by watching a juicy burger slowly rotate on your TV. If you want two burgers, go double or nothing and watch for an additional ten minutes. Feeling extra hungry, go for it and watch for another 15 minutes and you’ll get three burgers. But don’t think you can simply walk away and return five minutes later to claim your prize. Every 30 seconds or so the screen prompts the user to click a random button on their remote control. The only drawback here (besides wasting your time staring at your TV) is the method for receiving a coupon. 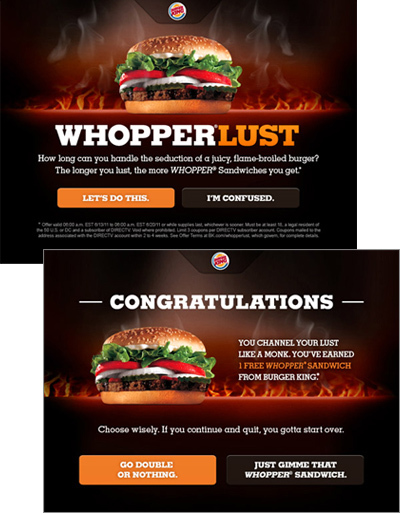 Once you have earned your free Whopper you must agree to share your address with Burger King who will then mail you… yes, I said mail, as in a printed coupon delivered to your door. This would have been a great opportunity for a mobile experience. At the end of each segment a unique code could appear (or a visual ID such as a QR code), which the viewer could then text to a shortcode associated with the campaign. The coupon could then be returned to the user by SMS and then scanned at a nearby Burger King restaurant. Digital Buzz reports that Burger King have already given away over 50,000 burgers this week. Considering they have to physically mail the coupons, using a mobile solution for instant redemption would have saved a lot of postage charges. Or, How about some Rotisserie Chicken? Swiss Chalet has had a similar channel takeover running in Canada on Rogers Cable CH 208 called the Rotisserie Channel. Promotional codes are supposed to appear on the screen every so often, however the only message I see directs me to the Facebook page for details on current promotions. Did I mention I was getting hungry? And, if someone knows of an effective solution to replace all those takeout brochures laying around my place please let me know. It should come as no shock to anyone who watches live TV events such as the The Oscars or weekly shows like Glee or Mad Men, that viewers are using both the internet and the TV at the same time. Increasingly that internet time is being taken over by mobile devices (smartphones & tablets) rather than a traditional computer. 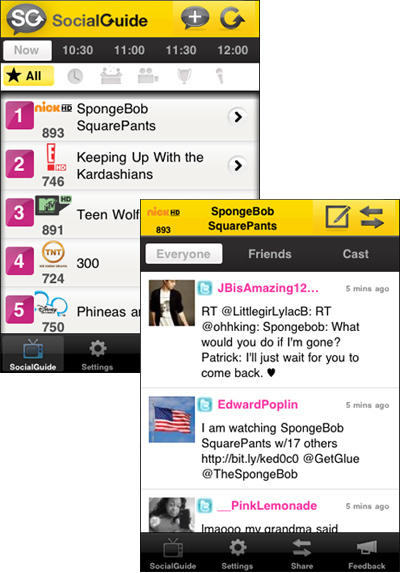 Applications such as GetGlue, Miso and Into_Now have been launched to allow users to ‘check-in’ to TV shows in the same way that they can check-in to real-world venues using Foursquare or Gowalla. One of the latest apps to cater to these Internet/TV multi-taskers is Social Guide, recently included in Time Inc.’s 10 NYC Startups to Watch. Unlike the other media check-in apps listed above, SocialGuide works like a Social Media- fueled TV Guide. Like any interactive TV Guide it first identifies your local cable company. (The application is US-only, so I used DISH Buffalo as my default). Users can choose to view all shows in each time period or filter them by Regular Series, Reality, Movies, Sports and News. The shows are listed in order by how many mentions are being shared through Twitter and Facebook (I only saw Twitter posts in my time using the app). All the tweets mentioning the show are visible in the default view, or they can be further filtered by Friends and tweets by the Cast. If you are just interested in which shows are being discussed the most, then SocialGuide will help you out. It’s amazing (maybe shocking) to see just how many people are posting comments on a Sunday morning while watching Spongebob Squarepants, iCarly or Yes to the Dress. SocialGuide is available for iPhone and Android. Fans of Top Chef Canada can now win a $15,000 GE Monogram Kitchen by scanning a QR Code that will appear on-air during the show over the next 4 weeks. People who want to enter the contest but miss capturing the code during the tv show can visit the Top Chef website and capture the QR Code from their computer screen. The only other way to enter the contest is by physical mail. This should be enough to motivate viewers to download and register their Mobio app. Mobio Identity Systems is a Vancouver-based company whose app is available for iPhone, Android and Blackberry. Once downloaded users are prompted to register their personal information. Once registered, a user can attach their credit card information to their Mobio account, turning their mobile phone into (in Mobio’s words) a “payphone”. Mobio users scan QR codes as they appear in email, on the web, in print or on television using the app. 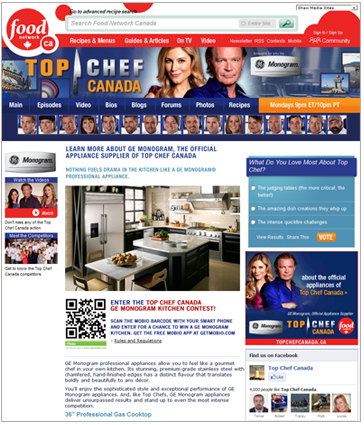 In this example with Top Chef Canada, the user is taken to a contest entry form within the Mobio app. The difference with Mobio is that there is no need to type in your information, the user simply checks the box for name and email. 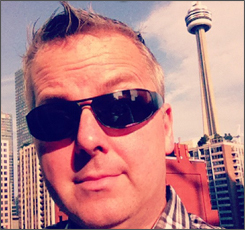 Back on April 27, Shaw Media (owner of The Food Network Canada) announced that they will be the official broadcast reseller of Mobio’s payment and marketing applications to ad agencies, media buyers and other clients across Canada. The whole experience scanning the code from the website is very efficient, the scan and contest entry literally takes seconds. I watched tonight’s episode and missed seeing any QR code on the air during the show. Did you see it? Top Chef Canada airs on The Food Network at 9pm ET/10pm PT.